Tiletoria imports and supplies Ceramica Fondovalle to the local market. Their Calcatta White infinite range is a luxury product that is set to take the South African design industry by storm in 2018. Classic touches blend with cutting-edge technology to create a unique innovation that offers ample solutions to modern architecture to decorate commercial and residential environments with a touch of refined elegance. 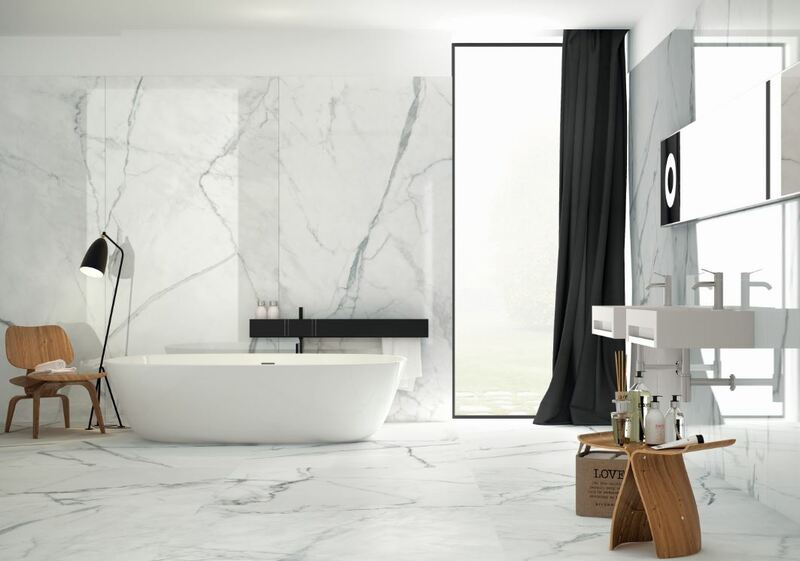 The Marble-effect porcelain stoneware reveals its powerful beauty, accented by bright, carefully designed background tiles that faithfully recreate the original stone. The Calcatta White slabs, enhanced by the large format, represent a real interior decoration element for contemporary and luxury architecture, offering the possibility of creating floors, walls and tops of prestigious kitchens with unique personalities. This flooring solution, recreated from a white background with grey and blue veining, has a modern, stylish soul. The 4 different slabs available in the 160 x 320cm format can even form a very original “continuous veining” effect when they are combined in a particular sequence. The formats in which Calcatta is available include 160 x 320cm; 120 x 240cm; 120 x 120cm; 60 x 120cm. The collection is enriched by two book-matching effects in the 120 x 240cm and 160 x 320cm formats. With more than 50 years of experience, we are a market leader in the production and sale of porcelain floor and wall tiles and slabs. Ever since 1962, Ceramica Fondovalle has pursued the goals of aesthetic refinement, quality, a focus on detail, technological development and innovation, safeguarding the environment and the land. It is a company made up of people, ideas and materials that come together every day to offer the Italian and international markets the best of Italian design in ceramics. This is why technical design, aesthetic study and pursuit of stylistic trends have always been central concerns for us, supported by on-going strategic investment and non-stop technological innovation guaranteeing excellent productive processes, exclusive top quality products and efficient service. For more information, contact Tiletoria on Tel: +27 (21) 202 0160 or via www.tiletoria.co.za.